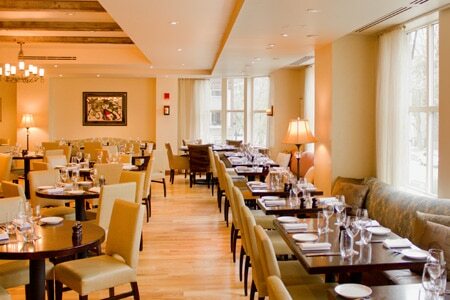 Bistro du Midi complements its French cuisine with a striking view of the Public Garden. : Bistro du Midi, a modern-style French café, took over the old Excelsior space with much fanfare. Brunch brings a selection of brioche french toast, pancakes with mixed berry compote and salmon Benedict. Dinner is true French bistro fare, from the array of pâtés to lobster macaroni gratin, and meats like seared duck breast with Swiss chard, gnocchi and black olives. Bouillabaisse in particular is not to be missed; it's served with shellfish or without (“classic”). Affable sommelier Kelly Coggins (Rialto) makes the lengthy wine list approachable; feel free to ask for tips. The collection focuses heavily on the south of France, and many selections are available by the half bottle. Service is suitably deferential.